Researchers say mesothelioma patients and others with pleural cancers are unlikely to suffer ill effects from this minimally invasive diagnostic procedure. Doctors in Beijing say a study of more than 800 procedures shows that medical thoracoscopy is a safe and effective way to diagnose or treat the symptoms of malignant pleural mesothelioma and other lung diseases. Surviving Mesothelioma has the full story. Click here to read it now. Thoracoscopy uses a single slender probe to visualize the surface of the lung (pleura) where pleural mesothelioma tumors start. It can be used to perform a biopsy or to diagnose and treat the buildup of fluid that is common with pleural mesothelioma. “Medical thoracoscopy is a valuable and safe tool in diagnosing malignant pleural effusion and minimal complication rates,” writes study author Yang-Bing Wu, MD, a respiratory and critical care medicine specialist. The study, conducted by scientists at Beijing Institute of Respiratory Medicine and Beijing Chaoyang Hospital, included thoracoscopies performed between 2005 and 2014. More than 300 patients were found to be suffering from pleural effusions. None of the patients experienced any serious side effects from the procedure. 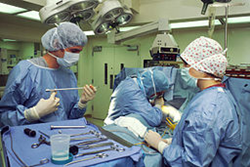 Mesothelioma patients are often recommended for medical thoracoscopy. This study should provide some reassurance that the procedure can be a safe and helpful way to diagnose and alleviate some of the symptoms,” says Alex Strauss, Managing Editor for Surviving Mesothelioma. To read more about medical thoracoscopy and the results of the new study, see Thoracoscopy Deemed “Valuable and Safe” for Mesothelioma Patients, now available on the Surviving Mesothelioma website.